You spend the night at the inn, but are awaken by loud voices. A guest is yelling at the front desk clerk about the food he was served. There's no way he can eat this! The clerk assures him that this is perfectly normal, but the guest is not convinced. It isn't edible! 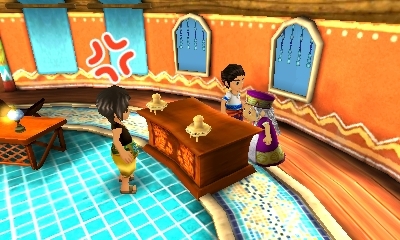 Haulani explains to you that they where just about to eat breakfast, but the inn guest didn't like the food. Tigre feels that the man is exaggerating about his dislike for the breakfast and wants to step in to stop the guy, but Haulani tells him to hold back. It's best to leave this to the innkeeper. Tototara comes in to see what all the hubbabub is about. The guest complains about the food to her. Tototara understands that the guest didn't like the food and then became frustrated with one of her workers. Tototara decides that they'll remake the guest's meal. She leaves and soon returns with a new breakfast for the inn guest to eat. It is much more appealing to the man! He thanks her and then apologizes for not explaining why he was upset directly to her. Tototara doesn't mind and invites him to stay with them again. After it was all over, Tigre is amazed how the guest suddenly became so friendly to Tototara. He wonders how she knew what the guy wanted to eat for breakfast. Tototara comes up and explains why; the guest comes from an area where the residents live in mountain caves, so they are not use to the seafood that is plentiful here at the inn. It is something she's been able to pick up just by observing. Tototara knows that she was expected to simply throw the man out, but asks you what you feel is the most important spirit of the inn. Choice 1: A feeling of gratitude? Ah, that's correct! She's glad you understand. Well that's a good guess, but there's more to it than that. The most important aspect of an inn is the gratitude given to to the guests. She wants them to enjoy the village and possibly return again someday. Sometimes it is necessary to listen to a customer, even if the customer is angry. She also believes it is good for everyone if they came to think of the in as an "ocean," as no one can remain angry while in the ocean. They come here to the inn to have a quiet, relaxing time. Haulani thinks he might have underestimated Tototara. She admits that she's not that amazing; who IS amazing is Ludus, who appears to have slept through all that rukus. Enough of that, let's have some breakfast.